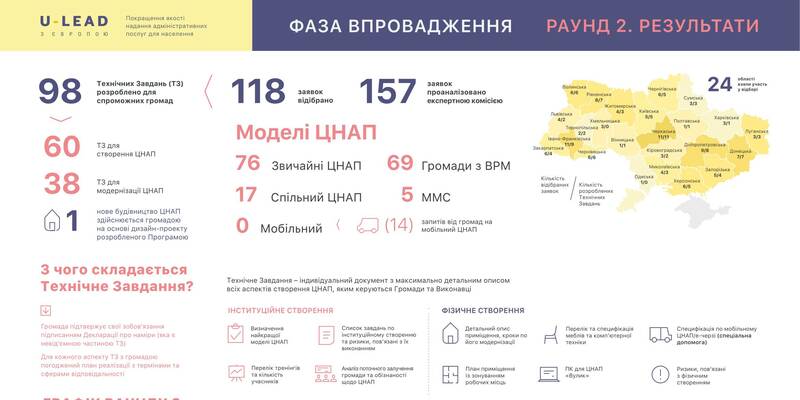 60 ASCs will be established and 38 modernised in 24 oblasts of Ukraine during the 2nd Round of the Roll-Out Phase of the U-LEAD with Europe Programme’s support to improved administrative service delivery. It is precisely the number of ToRs, developed by the Programme experts as a result of 2nd Round and approved by the participating hromadas, that will guide proper ASC establishment process. In general, due to Round 1 and 2 results, the proper ASCs will be established in 210 hromadas in Ukraine.